The inorganic nature of the BC-03 glass coating makes it fully resistant to oxidation and therefore more suitable for protecting paint. The hard physical barrier it creates also prevents paint from coming into contact with the air and acts as a strong antiscratch protectant. 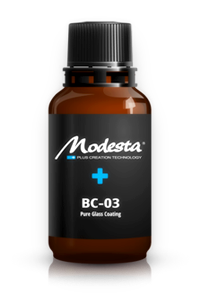 Modesta BC-03 does not crack, bubble, flake, peel, delaminate, detach or discolor at temperatures up to 700 °C. This new formula combines pure liquid glass and titanium dioxide for extra shine without affecting durability. It contains 0.16μm particles of titanium dioxide that reflect light with specific wavelengths, producing an instant luminous shine and gloss. Titanium dioxide is sensitive to photocatalyzation and produces traces of active oxygen when exposed to UV rays. This effect helps the coating to prevent the attachment of contaminants to the paint.